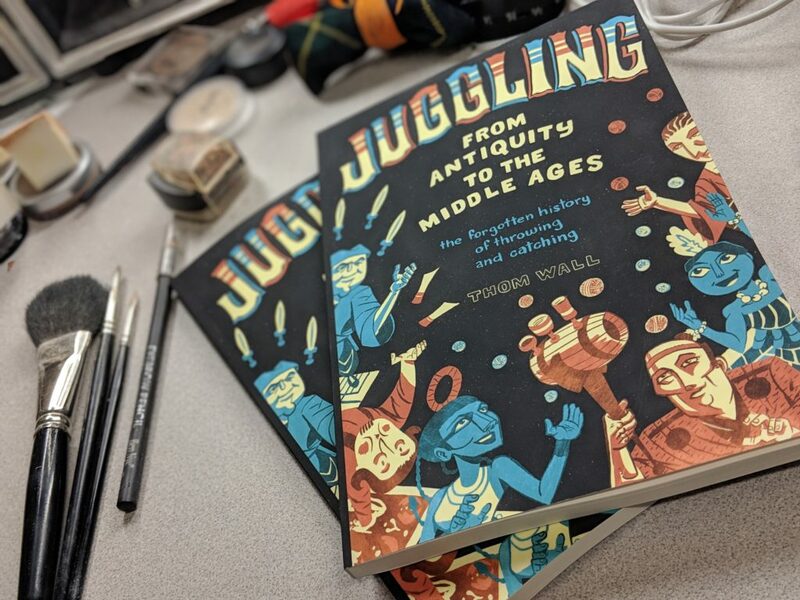 Juggling: From Antiquity to the Middle Ages: The Forgotten History of Throwing and Catching (more info here) is an in-depth exploration of poems, proclamations, and pictures supporting the creation and evolution of one of the most iconic acts within circus: juggling. The accomplished and award winning juggler/author, Thom Wall, puts his master’s degree to use spending innumerable hours collecting and cataloging evidence supporting the development of our modern day understanding of not only juggling but the cultural classification of the performing artist. The book sets out an ambitious task to “…take a critical look […] into the past — to the origins of our art form.” The author clearly states his use of primary, secondary, and tertiary sources while admitting the limiting factors of being “wholly scientific” and encourages future historians “dig deeper” providing trust in the work and hope for future editions of this text. Wall writes with an infectious excitement. One feels they are sitting with the author when he discovers old manuscripts, uncovers ancient photographs, or dusts off news articles revealing new facts or ideas. A necessary amount of footnotes aid in understanding the context of the information as well as provide levity and amusement as the author inserts his “humble opinions” and humorous asides. We begin to understand that throughout human civilization the word juggling has taken various forms, evolutions, and meanings. Whether it was the Egyptian’s hieroglyphic representation of jmd, Spain’s classification of Indian entertainers from the coastal region of Malabar, or the preserved traditions from the cultures of Polynesia, it is very evident that our understanding of juggling today is relatively young. Wall hides none of his enthusiasm in hypothesizing the implications of this knowledge. The final chapters brings our knowledge of the classification of juggling as we understand it now to the present day conversation. What exactly constitutes juggling and how do we define this idea? Wall accomplishes his task of enlightening the reader on the origins of juggling but has gone further. He has uncovered evidence of our innate curiosity with the world around us. Wall has found substantial evidence of the isolated development and evolution of skillful object manipulation throughout the cultural world. Juggling: From Antiquity to the Middle Ages: The Forgotten History of Throwing and Catching is surely one of the most important literature reviews to exist in the community of juggling, providing the circus with invaluable knowledge of our many-faceted origins. By studying the past we can begin to define our future. As circus competes with the growing technology of civilization, remembering our origins will surely support our growth in society and remind us our purpose. As Wall has shown, jugglers have always been entertainers bringing joviality and jest through any number of means, especially juggling. For more, please see the Midwest Book Review by D. Donovan.